The Norton Commando is an "Anywhere, Anytime" kind of bike and handles today’s city traffic just as well as it does touring at speed. That’s why the perfect upgrade is an Alton Electric Start kit. Stalled at an inconvenient or dangerous location? Press the button!! Have an old injury or the knee is just getting old? Press the Button!! A word to the wise. 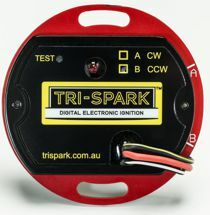 Whether you use the Alton E Start or not, fit a Tri-Spark Electronic ignition. I believe it should be the standard upgrade on any Commando (or any other coil ignition bike for that matter). It is state of the art and transforms the way your bike starts and runs. Always in stock at Ace Classics. Order one with your E Start for a special price!!! You own a classy and valuable motorcycle with strong Australian links in the form of Phil Irving who spent a good number of years with Velocette in design and engineering. A high quality and very attractive motorcycle, the Velocette has a reputation for being a challenge to kickstart. Although "A Real Velo Man" can start these wonderful machines with their masterly grasp of the Velocette starting procedure, there comes a time when the siren call of an Electric Start conversion becomes increasingly attractive. Don’t leave the Velo in the garage and ride a lesser bike, take the plunge and upgrade now! Good news for those who have a Lucas or Miller Dynamo fitted to their pride and joy. Ace Classics Australia is now the Distributor for Alton AC 12 volt generators. These beautifully made generators fit directly in place of the original and provide a maintenance free 80-90watts cruising with a maximum of 150watts. Weighing in at half the original and with retro styling, these are state of the art and come with a Podtronics Regulator, full instructions and a fully supported 2 year Factory warranty. Alton have a policy of continual improvement of all their products and the E Starters and AC Generators we are currently selling and fitting are testament to this. At Ace Classics we only associate with manufacturers in whom we are confident and demonstrate high quality and innovative design. Alton is such a company. All Alton products carry a two year warranty and Ace Classics provide full support Australia wide.